We use CNC machinery for circular saw sharpening and specialise in sharpening TCT (Tungsten Carbide-Tipped) saw blades using very high quality Diamond Grinding wheels. 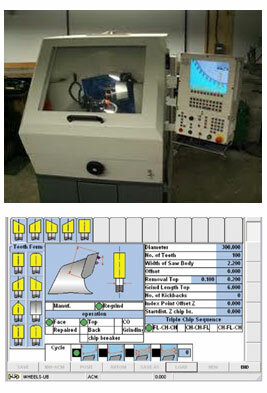 • TCT saws blades are side ground (side dressed), top ground and finally face ground for complete sharpness. • Once a saw has been side ground to produce the desired kerf for its application, subsequent sharpenings only require top grinding and face grinding to restore its sharpness. • Our CNC machinery can sharpen complex tooth profiles such as the hollow face ground saws, by using the high frequency spindle that turns at 60,000rpm. • Our 4 axis CNC grinder has the capability to sharpen saws consistently to the highest degree of accuracy (0.01mm), whilst facilitating high capacity for grinding and subsequently allowing us to maintain very quick turnaround times. • The performance of this machine is such that it redefines the meaning of sharp but don't just take our word for it, send us a saw to have sharpened and then you can see the difference for yourself. Our re-sharpening service is very thorough, fast and competitive. Contact us and we will be glad to discuss your sharpening requirements with you. Give us a try and see how our quality makes our customers happy.